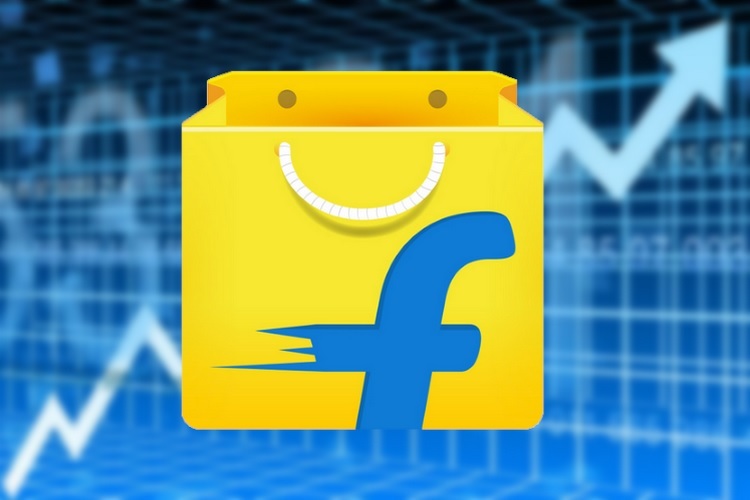 Flipkart and Amazon are undoubtedly the e-commerce websites to beat in India – even though Paytm Mall is snapping at their heels. Both offer consumers plethora of products, and the range is more or less the same. What sets them apart are the exclusives – whether they are smartphones, other gadgets or any other products. Flipkart and Amazon have tie-ups with multiple companies in India, which make them the exclusive official online retailer for a specific product. 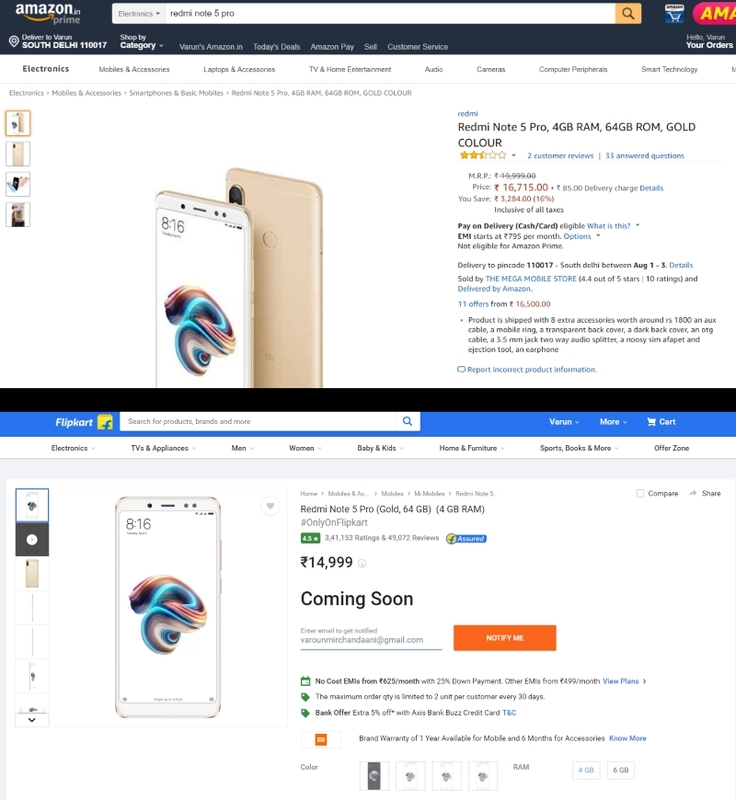 But those who frequent the sites would have noticed recently many Flipkart Exclusive products being sold on Amazon India as well by third-party resellers, with Xiaomi smartphones being prime examples. For instance, both the Asus Zenfone Max Pro M1 and the Redmi Note 5 Pro were launched as “#OnlyOnFlipkart” products. 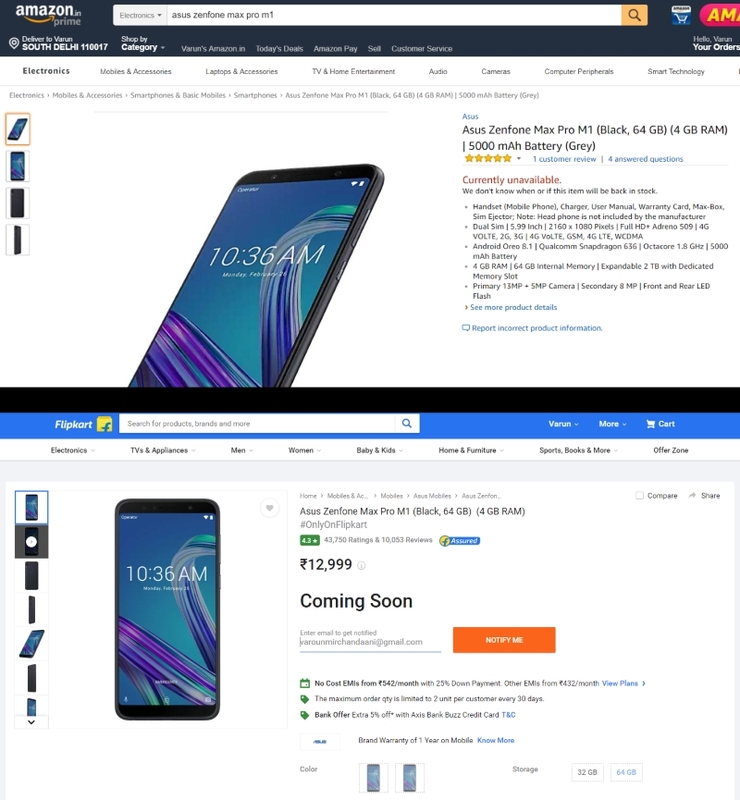 While both of them appear to be out of stock on Flipkart, resellers have been found on Amazon India, selling the product at a premium of up to Rs. 3,000. We reached out to Flipkart, to see what their Exclusive Product policy exactly is, and how they intend to tackle this situation. According to a Flipkart spokesperson, both Flipkart and Amazon are open marketplaces, which allows any seller to sell any product, regardless of how they’ve procured it. However, when it comes to exclusives, both Flipkart and Amazon work directly with the brands for the licensing, warranty, service and other things. So if a consumer buys the Flipkart exclusive items via Flipkart, they’d get all these services (including warranty) from the brand directly. However, if they were to purchase the product from Amazon (or any other third party seller for that matter), the consumer would only be given a seller warranty, and not the company’s, which is weak at the best of times. To explain things in a simpler format, if you buy a product that is Flipkart-exclusive from Flipkart, in case of any damage you’d get support from both Flipkart as well as the brand. However, if you purchase the same product from Amazon, only Amazon would be held responsible for any defects. In this case, Flipkart informed us that removing such reseller listings is Amazon’s prerogative. Both companies have had campaigns to educate consumers about the perils of buying exclusives on unauthorised platforms, allowing you to better understand which seller you should choose to buy your desired product from. As a personal note from Beebom, we’d also like to advise users to make sure that the product you’re planning to buy is supported by the brand. An easier way to check that is to simply head over to the actual product’s website and see information about the authorized or exclusive online sellers. The concept of open marketplaces might be beneficial for both Amazon and Flipkart, but as consumers, you’d have to be extra careful that you’re spending your money on the right product, which won’t leave you in a lurch if there are any problems down the road.